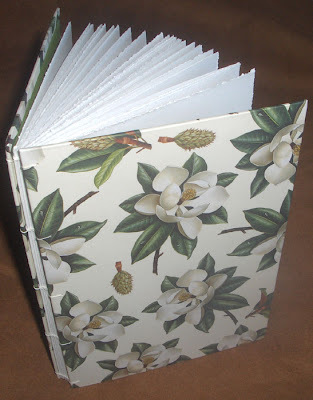 Next up in our group of book swap books, is this pretty gardenia book by Jenny, aka PaperLion, in Australia. 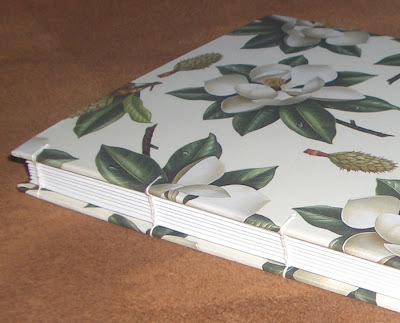 This book is bound using the Coptic sewing and she used such a nice white thread for sewing that it looks quite delicate, a great match for the gardenias on the covers! Jenny said, "I really like the simplicity of the Coptic stitch but my favorite part of the whole process is seeing the boards covered in their new papers. It sometimes takes me a while to stitch them into notebooks as I just like looking at them all lined up! 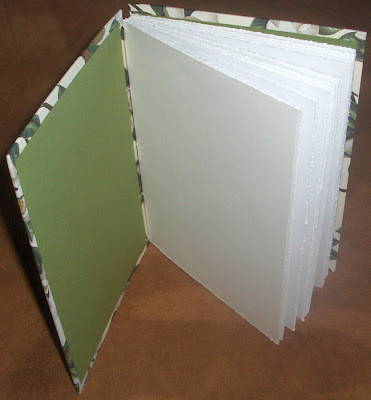 It's really exciting to be a part of BEST and know that one of my notebooks is going to someone else who is just as passionate about bookmaking as I am." Visit Jenny's shop, PaperLion.Etsy.com, to see more of her books. lovely gardenias - very summery!